This attractive heron is a regular but very rare visitor to Tennessee in the spring, summer, and fall. The Tricolored Heron was formerly known as the Louisiana Heron, though its range extends along the Atlantic coast from New Jersey southward to Mexico, the Caribbean, and South America. It spends the winters over most of this range. Description: This medium-sized heron has a long, slender neck and bill, a dark grayish-blue back, a grayish-blue neck with a narrow white line in front, and a white belly. Males and females look the same. 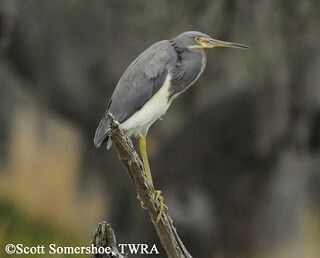 Adult Little Blue Herons are overall grayish blue, and lack a white belly. Great Blue Herons are much larger, have a paler neck and lack the white belly. Habitat: In Tennessee, found along lakes, rivers, and ponds. Status in Tennessee: Extremely rare visitor in spring, summer or fall, across Tennessee. In April 2009, one was found at the Gallatin Steam Plant, Sumner County. The oldest recorded Tricolored Heron was 17 years, 8 months old. Best places to see in Tennessee: Extremely rare visitor to lakes, rivers, and ponds across the state. Frederick, P. C. 1997. Tricolored Heron (Egretta tricolor). In The Birds of North America, No. 306 (A. Poole and F. Gill, eds.). The Academy of Natural Sciences, Philadelphia, PA, and The American Ornithologists' Union, Washington, D.C.